All transactions are safe and secure with a reliable history in online purchasing behind each of our associates. Buy the Liz Lemon Blerg! 30 Rock t-shirt to own 30 Rock clothing and merchandise. 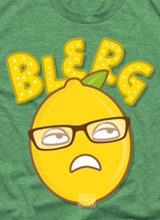 These cool Liz Lemon Blerg 30 Rock t-shirts pay tribute to one of the TV show's best catchphrases. It was first heard during a first-season episode and was used to express revulsion, deflation and disgust. Actress and series creator Tina Fey (Liz Lemon) explained, "Blerg is something we say around the writer's room and also since we're on network television we can't curse or anything...sometimes we run out of non-cursing ways of saying things." Pair this Liz Lemon Blerg 30 Rock tee with a Jack Generalissimo or Lemon Out design featuring the Liz Lemon quote. In addition to the Liz Lemon Blerg! 30 Rock tee above, browse the 30 Rock Clothing Gallery for more apparel like men's and women's clothes, kids shirts or hoodies.